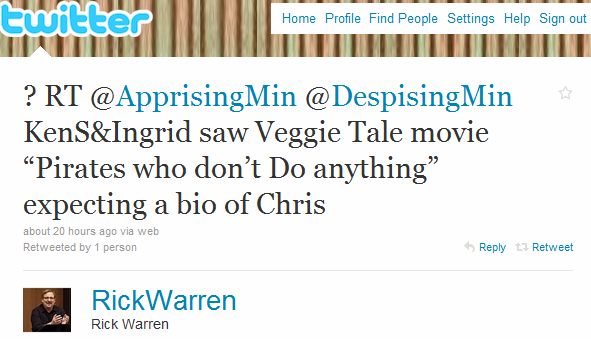 Apprising Ministries has been among the online apologetics and discernment ministries covering Piper-Warrengate when Dr. John Piper made the dubious decision to feature Purpose Driven Pope Rick Warren, with his quite elastic orthodoxy and twistable multi-tranlation Play-Doh Bible, as a keynote speaker at the DG 2010 conference Think: The Life of the Mind & the Love of God. I also pointed out in Decade Of Destiny With Rick Warren that by carrying posts like Desiring God Selling Bible Study Method Of Rick Warren! ?, Rick Warren—Scripture Twisting Is Not ‘Doctrinal And Sound’, and Rick Warren: Piper Approved!, I was bringing to you what some of the finest writers in field had to say about Warren’s pragmatic self-help lecture at DG 2010. You’ll notice that Warren wasn’t even man enough to take responsibility for this tasteless tweet, where he also includes Ingrid Schlueter of the Crosstalk Blog and myself, and attributes it to some spiritually spineless anonymous mocker of this labor in the Lord. In the days to come, this will undoubtedly prove to be a real tactical error by the PDL pope as I bring out the information I’ve been accruing concerning him. Some of which I’ve been bringing out in posts like Decade Of Destiny With Rick Warren and Rick Warren Presents Us Our Destiny Doctor where I’ve shown you that Warren has done the foreword to a book called Driven By Destiny: 12 Secrets to Unlock Your Future (DBD). I happen to have this particular work and it’s filled with the whacked Word Faith mythology of its author, pastrix Dr.LaVerne Adams who bills herself as The Doctor of Destiny. Women participate equally with men in the priesthood of all believers. Their role is crucial, their wisdom, grace and commitment exemplary. Women are an integral part of our Southern Baptist boards, faculties, mission teams, writer pools, and professional staffs. 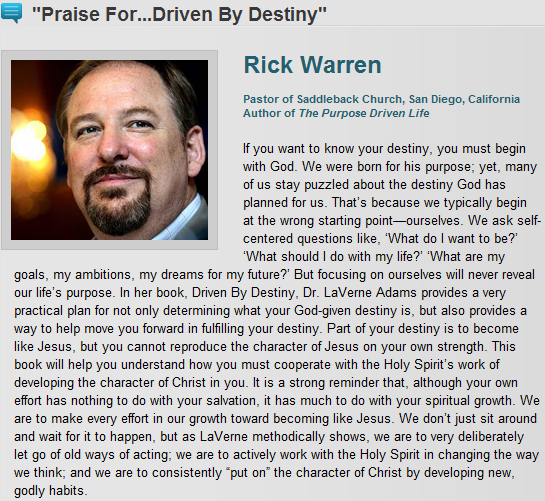 Now you have the proper background from which to see just how far out on a limb Rick Warren has actually gone. With this all in mind, I’ll point you to the October 18 Fighting for the Faith program Why Would Rick Warren Endorse Dr. Laverne Adams? In the segment below Chris Rosebrough—whom Rick Warren dubbed a pirate who does nothing—provides Biblical commentary during his review of a sermon by pastrix Adams called God’s GPS. God’s GPS by, now, Dr. LaVerne Adams whose book about divine destiny, the foreword was written by Rick Warren…we didn’t hear any Biblical teaching there, did we. So, again, I come back to the question, ok—this is not guilt by association… It’s not like I’m saying, “Oh, what is Rick Warren doing associating with LaVerne Adams?” No, no, this is guilt by endorsement. 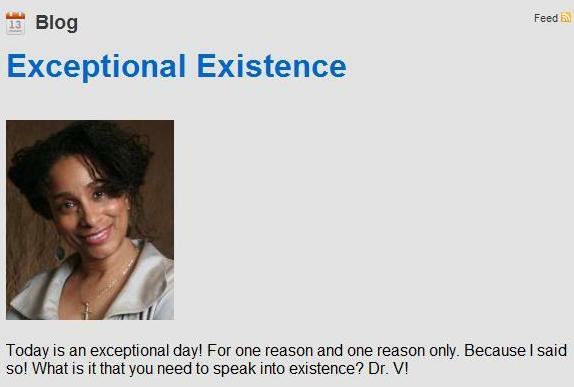 Why is Rick Warren endorsing the teaching of Dr. LaVerne Adams? Well, to paraphrase Dr. John Piper: I’m gonna need help to know why we should feel anything but bad about his decision to expose Rick Warren to the Reformed camp when he promotes this kind of fool.